This rich and creamy chocolate and black cherry trifle is simple to make but offers a really indulgent alternative to a Christmas pudding. The layers of chocolate muffins, chocolate custard and liqueur-soaked black cherries can be assembled the day before, chilled, then just finished on the day. Break the chocolate into even-sized pieces and place in a heatproof bowl. Rest over a pan of gently simmering water for 3-5 minutes, stirring occasionally, until the chocolate has melted. Remove from the heat to cool for 5 minutes. Carefully stir the custard into the chocolate, cover and allow to cool completely. Meanwhile, cut each of the muffins into 4-5 thick slices. Arrange half the muffins in the base of a large glass trifle bowl and cover with half the cherries. Sprinkle with half the kirsch or brandy then spoon over half the chocolate custard. Repeat the layers. Chill until needed. Just before serving the trifle, remove from the fridge and cover with the double cream. 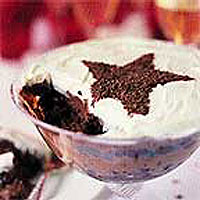 Place a large, star-shaped cutter in the middle of the trifle. Fill with the crumbled Flakes. Remove the cutter and serve immediately. If you don't want to use alcohol in this trifle, substitute the kirsch for 6 tablespoons of the syrup reserved from the cans of black cherries.